VIP Resort Properties, LLC, is a new Property Management Company ready to give you have your Best Beach Vacation ever! Help us do that by letting us know what we can do to become THE BEST Property Management Company on Panama City Beach! Please let us know how we're doing by calling us at 1-844-832-2419 or 1-850-708-1214 or emailing us at [email protected]. Or, if you are staying with us, you can complete our guest survey included in your Welcome Packet and return it to us on departure. We enjoyed our stay here! Unit is beautiful and a great size! Pools are great too. Management had wonderful customer service and communication with me. We will definitely come again! Absolutely gorgeous property with the most amazing view!! We didnt want to leave. Plenty of space for everyone! Great communication with the property owners/manager... very nice to work with! Wouldnt hesitate to stay again. We had a really good time here. There were only 4 of us so each adult had their own bedroom and the 2 kids shared a room. The view is awesome! No issues. Wi-Fi is pretty bad but we made do. We couldnt have had a more perfect place for 11 of our family to stay and celebrate our birthdays and anniversary. This place was spacious, beautiful and comfortable. They allowed our first guests to enter early since it had already been cleaned thus allowing them beach time and not worrying where to leave their luggage. And such a fantastic view from our balcony allowing us to view dolphins our first morning. The beach chairs & umbrellas were an extra plus we didnt have to seek out ourselves. We highly recommend this place if youre planning a stay in Panama City Beach. Weve been coming to PCB for several years now with the family and this stay was by far the best. The location was perfect- not too crowded, less traffic in the area. We normally stay closer to the "action" and with 5 kids that can be stressful. This was a perfect spot. The condo was laid out perfectly so that we had our privacy and the kids could do their thing without being right on top of us the whole time. We arrived Sunday and Monday morning (early!) we realized the coffee maker wasnt working. We reached out to Donna and Jennifer about it and had a brand new replacement within 25 minutes. We didnt expect that, but were extremely pleased as you can imagine! They handled everything for us, including check-in, getting parking passes, etc. We will definitely be staying with them on our next trip without a doubt. We highly recommend using Donna and Jennifers services. The pictures are exactly how the condo looks. I booked this in November and it was a super easy process and I was kept informed the entire time until our stay at the end of March. Every time I had a question I had an email response within 24 hours (most of the time within an hour or two) Fantastic area Loved it and will go back without hesitation. Damaged, but unbroken lovely coast Really loved our stay. Most places now open after horrific hurricane Michael. The condo was lovely with one of the best views we have ever had. Very quiet as opposed to other locations we have stayed at in PC Beach. Staff at VIP were VERY hospitable. Great Place to stay!! Enjoyed everything about this place. Donna and Jennifer were great to work with!! Great condo! We found the condo and building to be clean and well maintained. The third floor was perfect for us. It was a friendly atmosphere and a great view of the beach. Our only problem was that several bulbs were burned out and we couldnt find any spares. Also the living room could use a larger TV. Our overall impression was very favorable and we hope to return. Great getaway Very nice condo great size rooms, enjoyed the deck and the pool and hot tub. Walks on the beach . Jen and Donna were great . Great Stay We loved our stay at this condo! The location was great! The condo was clean and had everything we needed! Donna and Jennifer were wonderful hosts! We will definitely be back to stay here! Everything you could want in a vacation property The condo was cute, clean, and perfectly furnished. Ive never stayed in a condo that had a more completely stocked kitchen, and the full size washer and drier were a great bonus. We. Loved it Nicely decorated. The of the Gulf from the balcony was awesome & relaxing! Fantastic Wonderful layout with plenty of room so you dont feel cramped. Be prepared to bring coffee and extra dishwasher and laundry detergent. Great view from oversized balcony. Overall a great place to stay. Great Experience even when they just got hit with Hurricane Michael Very nice furnished clean condo. Nice pool and easy walk to the beach. No elevator to fight with. Would highly recommend. Our penthouse was amazing! Wonderful view, access to beach, and the management was great. We had our week cut short by Hurricane Michael, but the 3 days we had there were excellent. Donna and Jennifer took great care of us. The apartment was amazing and the location was perfect! Wonderful Week Great place to stay. Right on the beach and clean. Nothing like swimming in the ocean during the day and then in the evening swimming in the pool. Sunsets at night are unbelievable. Close to restaurants and stores. Will be going back. Best stay at the beach! Our stay at Princess was awesome! We had 6 in our group and the condo was extremely clean and comfortable-we had plenty of room for all. Will visit again for sure! Extremely Nice and Reasonably Priced We had a great time and really enjoyed all the extras that come with this property over a hotel room. Its wonderfully decorated and much more feels like a fully furnished house with a great view. We will definitely be back! Beautifully decorated Loved the Condo, very easy check in process with everything needed just like home. Great view Condo has amazing views. Ladies were great to work with they kept in contact with us via phone and email ,wonderful customer service. Will use again if in the area. 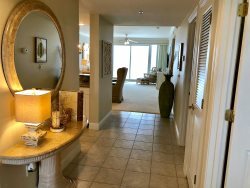 very nice condo roomy very clean, nice location, owners were very nice and helpful we had fun if it wasnt for the red tide that came in. Excellent views! An extremely spacious, plush unit. The management team is top notch. You will not be disappointed. We rented the unit last minute for a family funeral in Panama City. Jennifer (management team member) contacted us personally to discuss our needs. From entry, the unit was amazing! The layout is very spacious with private space for all guests. The foyer and living space is airy and maximizes the usable area. The guest rooms were impressive, each with baths that were far above adequate. The kitchen and dining layout was very functional with all necessary cooking/hosting accessories one would desire. The owners have definitely taken guest needs into consideration equipping the unit. The balcony is something to behold. It shows well with superior easterly views of the pass (nautical traffic) and westerly views of the beach. We could not have desired a more refreshing stay during our difficult time.